These delicious Mini Rewards turn anytime into treat time and help keep training fun! Natural Balance L.I.D. Limited Ingredient Diets Mini Rewards Dog Treats are designed with a single animal protein source and limited carbohydrate sources, and are a great way to reward and motivate your dog. Natural Balance L.I.D. 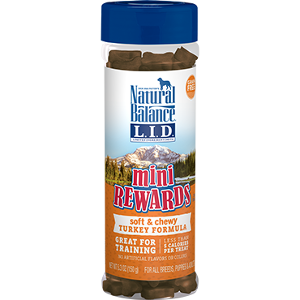 Limited Ingredient Diets Mini Rewards Dog Treats are made in turkey formula for the delicious taste they love and are less than 5 calories per treat. Turkey, Potatoes, Peas, Glycerin, Cane Molasses, Sweet Potatoes, Salt, Guar Gum, Natural Smoke Flavor , Citric Acid (Preservative), Mixed Tocopherols (Preservative), Rosemary Extract.